I decided a change was in order! When we first moved into this home I was so thrilled with all the storage. 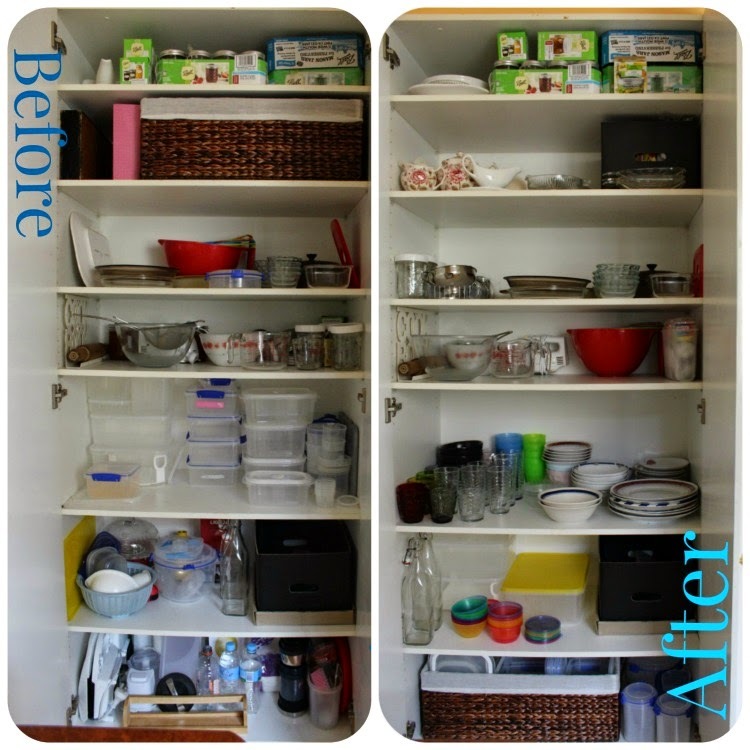 Two double pantry cupboards and under bench cupboards meant we had almost twice as much kitchen storage space as what we had in our old house and I spread everything out and enjoyed the space, and that's the way it stayed. In my de-cluttering process I look at things in terms of them being worthy of their place, space or accessibility. When we first came here the children were younger and needed things like Cups and plates to be low so that they could reach them and I was thrilled to realise plastic storage containers no longer needed to be in the lowest space ready for sticky, curious little fingers. Now they are significantly taller and we were all bending to put away dry dishes or get ourselves a drinking glass. This is how it looked when I started The party basket contains streamers, party hats, candles for cake, any picnic ware and colourful napkins. etc ... Party stuff. :) However as this only is used a couple of times a year I deemed it not worthy of that huge space allocation at that level. The other big thing I was thinking was that my plastics could be nested rather than stacked and while I use them often they really don't warrant that space allocation or position, it could be used in a way that was more valuable. Then how about all that stuff I rarely use? does it deserve to be in an easily accessible freely accessed space? 1. I just tidied and rearranged the top shelf a little its at almost ceiling height so I see it as a good storage spot, I cant see what's at the back if I'm standing on the floor. Next to my preserving jar stock pile are some a serving plates. 3. This shelf is now for Jam making supplies and Pyrex cooking and storage pieces. 5. So where all that plastic used to be is now the home of our Crockery and drinking glasses. 6. I really just tidied up and reorganised this one. My 'lunch box' box works well here and the space suited other plastics that we use quite regularly, mainly some big storage pieces that would not fit on the lower shelf. 7. Lastly, way back down at the bottom again, are all the plastic storage containers, nested in the basket! with other pieces that have rounded sides next to it. The basket makes it easier to pull out and grab what you need. Its certainly not as convenient as it was previously but it works. I have since modified this a bit and added a couple of stacking shelves to the crockery and pyrex spaces. What I didn't realise when I moved all of this is that I ended up with pretty much everything we use on a daily or weekly basis to one area. Pots and pans have their own space and Tea cups are over by the kettle. It works quite well. The remaining 'barely used' things are now in an under bench corner cupboard. I'll go through it again at some time in the future with a tougher 'throw away, put away, give away' mentality. Gosh that was a big long one, wasn't it! Congrats if you made it right to the end. 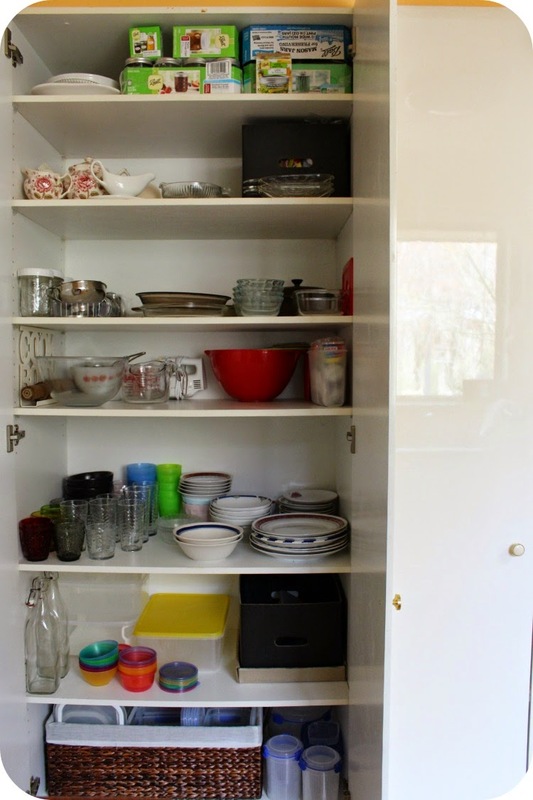 I hope you liked this peek into my cupboard, its not especially pretty or the sort of thing I typically post, though I hope it might get you thinking about how you use your space and if there is a way to make it work better for you! 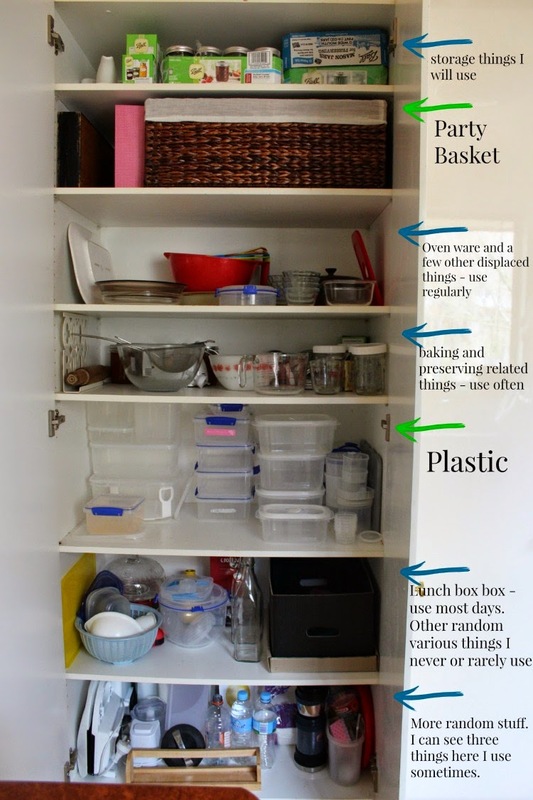 Good job on your cupboard. I am about to do the exact same thing in my bathroom! !